She Is Media is excited to partner with Gobble! It’s the convenience associated with takeout along with the health, satisfaction, and freshness of a home-cooked meal – perfect healthy meals for busy professionals! 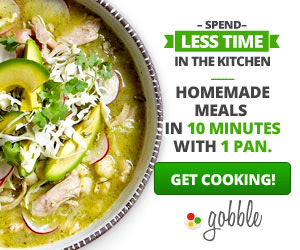 Farm fresh 10-minute gourmet dinner kits with 3-step instructions delivered to your door. Earn $18 with our healthy new subscription program! Preview the Gobble lander here. Get paid $18 for each sale made through your affiliate links.